Where Has All The Volume Gone? In the 1982-1983, 1987, and 2001-2002 bear markets, volume expanded with volatility. The only other bear market that has occurred in declining volume was the one during 1973-1974. This is not the first study I that have done that strongly parallels 2008-2009 to 1973-1974. The question then becomes, “If the declining volume is legitimate, what occurred in 1973-1974 that is similar to the last bear market?” That is a study in and of itself. The second and most likely explanation for the declining volume is that in the last decade, Electronic Communication Networks (ECNs), Crossing Networks, and Dark Pools have allowed for transactions of NYSE issues that do not necessarily end up being recorded as daily NYSE volume. It is likely, that the NYSE activity has not declined in as much as the players have simply migrated to other playgrounds and this is a trend that could still be in its genesis. If this is the case, technicians that rely on long term volume studies will be forced to convert to a more encompassing volume count. Edit: Babak here, I thought I’d add this chart to Wayne’s discussion of volume - from the research paper titled Trading in the 21st Century by Prof’s Angel, Harris and Spatt. A more aggregate measure of volume is provided by the NYSE here. There, they define two different data sources, NYSE Daily and NYSE Group. With the explanation that Group includes volume executed at NYSE Arca (electronic). You will also note that on Yahoo’s finance stats page, they state that their volume includes volume from pre-market and regional exchanges and their daily volume vastly exceeds that which is listed as floor volume. In the one volume analysis in my model, I use a trailing 5 and 20 day volume total relative to a trailing one year total on the traditional NYSE volume data and then do pattern recognition on the relationship compared to prior historical data points that are at similar levels and in similar price trends. My instincts are that given that I am using a trailing one year comparison, this is a valid approach, but it is under review. The above is an output of some of the background research that I thought you might appreciate and possibly benefit from. I was just reading the press release from the MTA web site. Wow! Congratulations! By the way, do you have a web site or other sites where you blog? I am still trying to figure out what I want to be when I grow up and exploring some different avenues. For now and until I get it sorted out, I am sending out my daily comments via email and you can be added by emailing me at wayne@witterlester.com with the title “ADD ME TO DAILY EMAIL”. I’ve got some stuff I’m working on this morning that I’m looking forward to wrapping up and sharing. Also Earnest, Babak should take coauthorship of my post, as he serves as my editor and touches up research nicely, so in regard to other post, I am comfortable sharing some of my research with Babak and his readers. Nice post, I also wonder how much legitimate volume do we have excluding HFT.. I really don’t know that it’s all that complex. Declining volume might be as simple as the fact that many/most asset classes peaked, plus or minus, in about 2006. An orderly / dis-orderly(?) debt /liquidation cycle and the pain associated with such unwinding just naturally reduces the general appetite for risk. A whole generation of soon to be retired baby boomers have pulled in their horns regarding risk going forward. Witness the money flow into fixed income instruments as well as the lack of leveraged buyouts. With the S&P having seen 10 year lows, should there be surprise that volume is approaching 10 year lows as well? 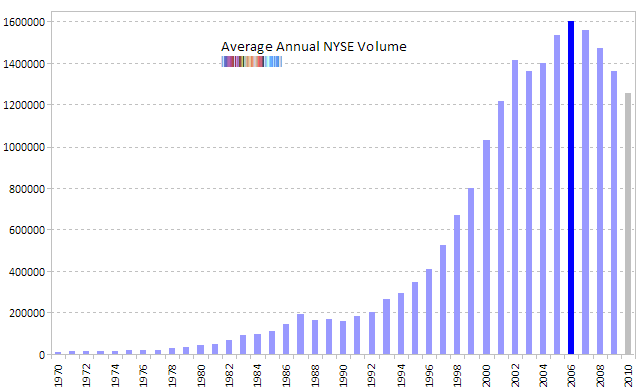 What of the years from the 1970’s when total daily volume of 12 million NYSE shares were record making events? Those were the days of NO financial futures, and listed stock options were in their infancy. I find volume as an indicator is most meaningful with respect to recent measures rather than historical measures. My personal index trading plan (posted daily) is volume derivedt but it only requires a short term perspective, i.e. the KISS principle in action. It would be interesting to see what percentage of 2010’s volume is represented by trades in Fannie Mae, Freddie Mac, Citigroup, AIG, and Citigroup. These stocks are unprecedented outliers, in price, float, and volume, that make 2010 a difficult comparison to previous years. Stripping away speculative interest in what could be called unprecedented day trading activity in just a few names makes the 2010 volume decline even more significant. You have to go back to 73-74 to find declining volume in a bear mkt and even in that case it was a 2 year phenomenon, not 4 years as we are currently experiencing for the first time. There is the possibility that there was a similar aversion to risk in 73 and 74 and if that is the case, you would have to view it as a positive for equities. I haven’t come to a complete conclusion yet, but if I had to say right now, I’m guessing about 75% resulting to electronic trading and 25% due to risk aversion? ?